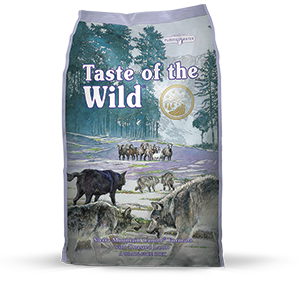 Bil-Jac Select is specially formulated with the nutrients your adult dog needs. 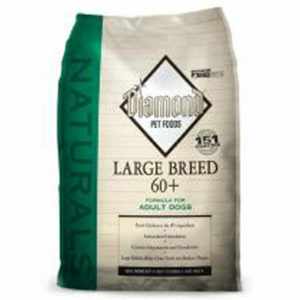 That simply means he’ll receive the most balanced nutrition possible to the freshest, dry dog food available. 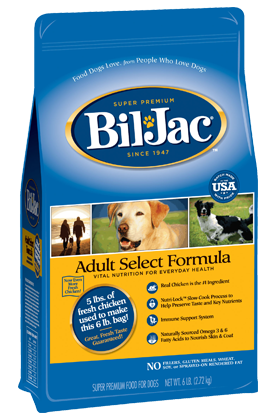 We recommend feeding Bil•Jac® Adult Select Formula on a scheduled and controlled basis. Most adult dogs may be fed once daily. However, twice a day feeding may be preferable based on specific needs. Use the feeding chart as a starting point. 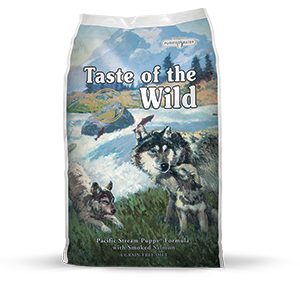 The optimal amount to feed will vary according to age, environment, and activity of your dog. Make feeding adjustments to maintain optimal weight and condition. Fresh water should be kept available at all times. . Bil-Jac® Adult Select Formula is good for puppies. Most puppies will require twice as much as adult dogs of the same weight. At weaning, feed puppies 3 to 4 times daily until 6 months old, then twice a day until 12 months old. You can best judge your puppy’s needs by checking weight and conditioning. Store this bag in a cool, dry place. 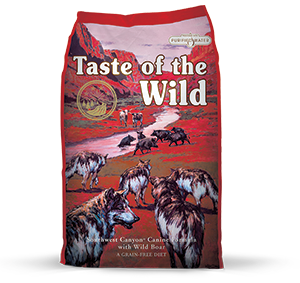 Chicken, Chicken By-Products (organs only, source of arginine), Corn Meal, Chicken By-Product Meal, Oatmeal, Dried Beet Pulp, Brewers Dried Yeast, Flaxseed, DL-Methionine, L-Lysine, Sodium Propionate and Mixed Tocopherols (preservatives), Salt, Vitamin A Acetate, Vitamin D3 Supplement, Vitamin E Supplement, Riboflavin Supplement, Niacin, Biotin, Choline Chloride, Folic Acid, Thiamine Mononitrate, Pyridoxine Hydrochloride (Vitamin B6), Ascorbic Acid, Vitamin B12 Supplement, D-Calcium Pantothenate, Manganous Oxide, Inositol, BHA (a preservative), Ferrous Sulfate, Copper Sulfate, Zinc Oxide, Cobalt Carbonate, Potassium Iodide, Sodium Selenite, Rosemary Extract.